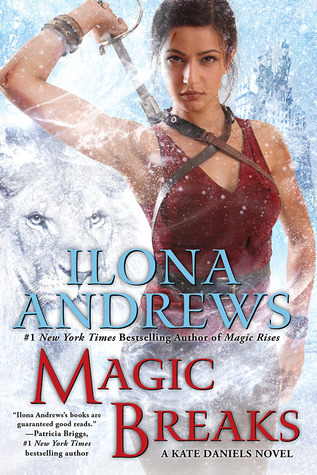 Magic Breaks is the newest Kate Daniels book by Ilona Andrews. As the mate to the Beast Lord, Curran, former mercenary Kate Daniels has more responsibilities than is seems possible to juggle. Not only is still struggling to keep her investigative business afloat, she must now deal with the affairs of the pack, including preparing her people for attack from Roland, a cruel ancient being with god-like powers. Since Kate's connection to Roland had come out in the open, no one is safe- especially those closest to Kate. 1.I really enjoy the world that Andrews has created in the Kate Daniels. The post- magic shift world is fascinating with magic and tech rolling in waves through the world. I love that it is set in Atlanta, my home city, and being able to identify where places are in the book. Also, I find it interesting to see how this new world with magic in it changes famous places in the city. 2. I love that even after seven books into the series, that I can still see Kate develop as a character. In the beginning she was the person who made almost no personal attachments to others, and was a strike first ask questions later kind of girl. Now she has lots of people she cares about, and she is really thinking decisions through more often. 3. Kate and Curran are one of my favorite couples. They balance each other so well, and they are equals in their partnership. They help each other see perspective, and have great faith in each other. Plus, the banter between them is great. 4. I really liked Desandra in this book. When she was introduced in the last book, Magic Rises, I was not so sure about her. In this book, she proved herself to be smart, cunning, and funny. I do hope she makes more appearances in the future. 5. This book delve more into Kate's family history. I have to say that Roland was not entirely what I expected. And I wonder how things will play out in the future with him.